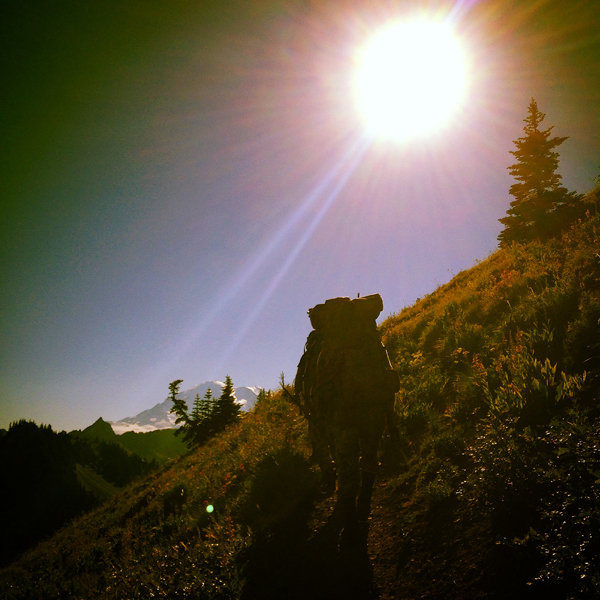 We are excited to introduct the all new- Wilderness Athlete Community. The new Wilderness Athlete Community will be the ideal place for our community to share, ask, questions, solve problems and help each other to experience the most epic of outdoor adventures. Home of all things nutrition and fitness for the Wilderness Athlete. Post recipes, share advice for maintaining motivation, and suggestions on how to successfully reach your daily activity level goals. The only stupid question is the one that doesn't get asked. Let's all benefit by picking the brain of Mark Paulsen, a man with unique experience and knowledge of the sports nutrition world. Coach Mark Paulsen has been training collegiate athletes and developing solutions for Outdoor Performance Nutrition for over 20 years. 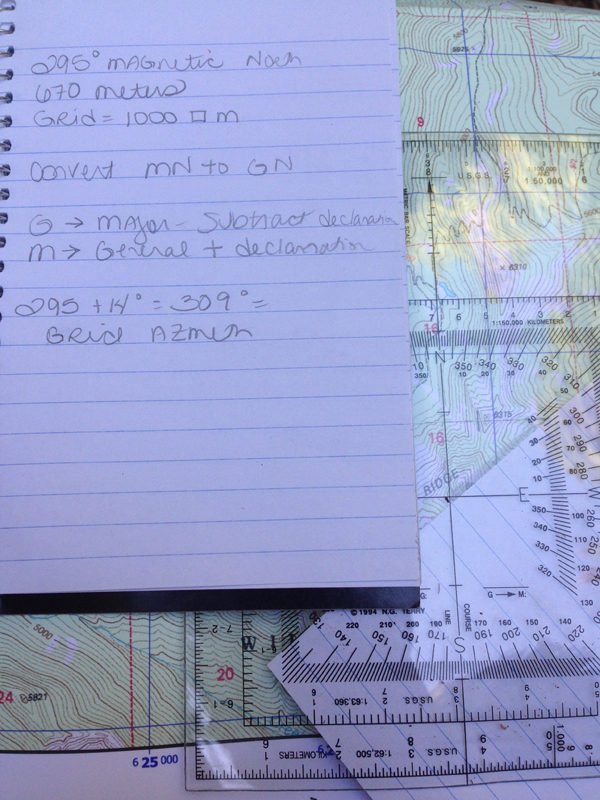 How, why and what we do to optimize our performance in the wilderness. Everything from kettlebells and lunges to gear tips and backcountry food choices that help us succeed. There is strength in numbers. Sharing our secrets for success and struggles along the way will elevate our results on day 28. We would like to invite you to join and help us grow our team. This week, sign up for an account on the new forum and get access to a special 15% discount code to use on our online store. 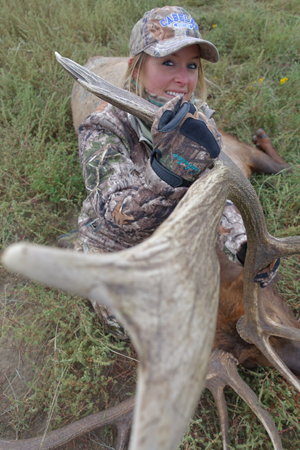 The calm before the storm…You have spent weeks, months or perhaps years dreaming about this hunt. The pursuit of Stone Sheep in Northern British Columbia is a hunt that I still dream to embark upon for myself; in the meantime I am thankful to accompany my good friend Bryan Martin in his pursuit. I guess one could say that I am living vicariously through my friend. Jeff Jamison also made the trek with us as an expert videographer, photographer and editor. Jeff is like me, big hunting dreams and lover of the outdoors and adventure. The three of us, kindred spirits are a perfect combination to take on such a remarkable adventure. An 8 day backpack hunt is no easy feat to prepare for, especially when you are trekking into land that remains mostly untouched by man where you have no resources accessible to you except for the critical items that you bring along. Thankfully, I spent hours in my garage organizing gear, double checking lists, ensuring that nothing was missed or left behind. This time spent at home made my arrival to camp very enjoyable. While Jeff was mind boggled over cramming necessary gear and food into 5500-6000 cubic inches, while attempting to maintain 70 pounds, I was all ready to go. Mind you, I still managed to forget my camera battery charger and extra spotting scope eye piece behind. Checking and double checking all components of gear is a tedious but necessary task. It is virtually impossible to have enough gear and food in less than a 6000 cubic inch pack and weighing less than 65-70 pounds is extremely difficult. My pack was the smallest at 5200 cubic inches and 73 pounds with water; no easy feat for my 5'2" frame. Bryan was a bit behind on his writing assignments and took an additional day to finalize work before we could begin the hunt. I used this precious time to write, get out my newsletter and even take a long nap. It is best to begin a grueling trip with a fit but well rested body. When it was go time, I was ready both physically and mentally. It was late when we arrived at the river’s edge; 8:00 pm and darkness sets in just after 10:00 pm. We literally had two daylight hours to inflate the Zodiac, conduct an exploratory run down the river to determine our take out and logistics and move everyone and all of our gear. Bryan always seems to enjoy keeping everyone on the edge of too much adventure. The last thing I wanted was to end up with was a capsized boat in icy glacier fed waters in the dark. Luckily for us, the river expedition went off without a hitch and we made it safely with all of our gear just before the darkness set in. Our first night, we camped by rivers edge in the heavy timber with a beginning elevation of 2009 ft. The first day's hike is always mentally and physically the most difficult for me. Your pack is at its heaviest and your body and mind have to adjust to the extreme load, steep angle of ascent and thick heavy bush. Because the timber and bush are so thick and dense sometimes you feel like you have hiked for hours without making traceable progress. The heavy bush pushes you backwards as you make your slow attempt at gaining elevation. Luckily, everyone started with well rested bodies and we were all more than excited to be heading out into the back country. There are trails throughout the bush where bears have travelled year after year. 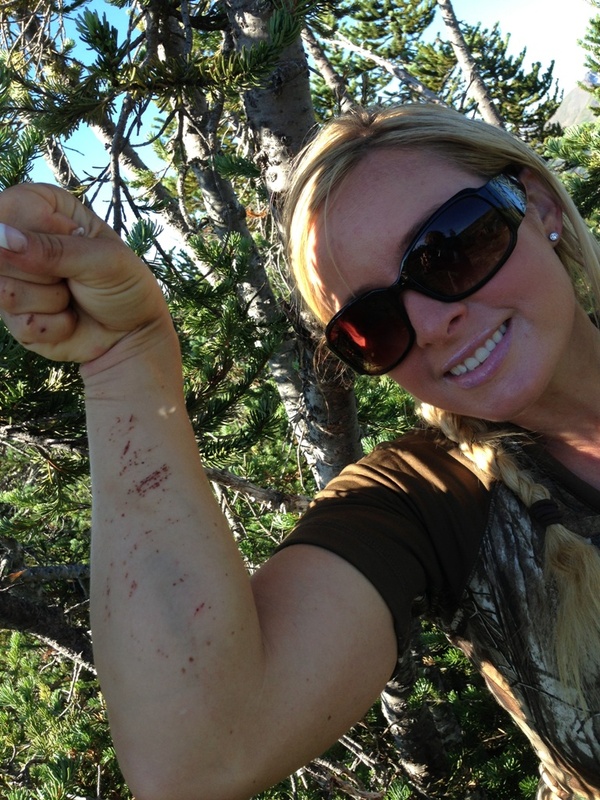 We don't typically use the bear trails as coming face to face with a big grizzly bear is a less than ideal situation. There is many a foul word yelled when the Devil's Club bites into your flesh breaking off causing pain for not only hours but day's if you are bitten. Bryan took the bite of the Devil on numerous occasion and his hands showed the thistles and swelling that were left behind. Not all of the plants are unpleasant like Devil's Club and I certainly was not expecting to find plump ready to eat blueberries scattered along the mountainside. Snacking on berries from the garden of Mother Nature in such a beautiful place made our climbing breaks a real treat. After traveling a short distance of 1.4 miles and ten grueling hours later we finally reached sub-alpine, 4400 ft elevation, just as the sun was beginning to set. This was a heinous hike due to the heavy bush that left our bodies worn out and ragged. The time and location and setting were perfect for setting up camp for the night. In the morning, the sun’s rays warmed up my tent waking me like a gentle tickle from a lover. The views were enough to make the combination heaven on earth. 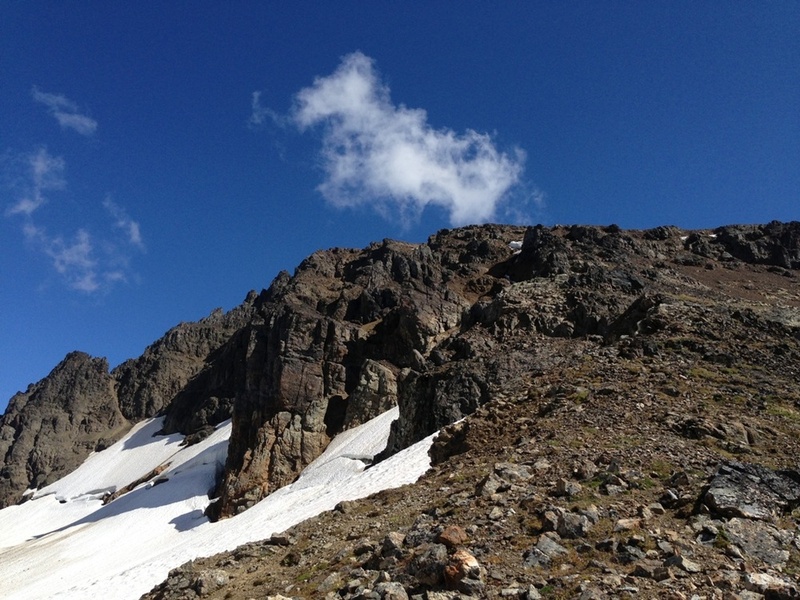 Alpine is my favorite elevation to camp and hike because you are so close to the sky, the mountain speaks to you here. The beauty intoxicates you but the reality is that you must put that pack back on and keep pressing forward, farther from man closer to God, hopefully that much closer to finding one of the most incredible of animals in the world, the stone sheep. The moss and lichen squish under foot, the shale rock easily slips out from under you, grasses blow in the breeze. This is where we want to be, where our vantage point allows us to see for miles and our optics get to do the walking for us. The particular band of rams we were looking for had literally not been seen by man since sometime between 1996-2003. Bryan had heard rumors of a couple of Boone and Crocket rams that that was spotted all those years ago. Come to find out, we were literally chasing a ghost ram(s), hoping that this particular gene pool would be found still living along the mountainside. Even after a full day of hiking we were a long way off from being in position to spot the rams; if in fact they even exist. Climbing vertical mountains is not easy with heavy packs on, however the rocky alpine terrain offered a welcomed break from the bushwhacking from the day prior. Step, lock out my knee, step and repeat. Slowly but surely you will reach the top. Jeff, a newcomer to alpine hiking was learning the art of rock walking. There is a technique for bounding across the rocky mountain surface. The beauty of it is that the higher you climb the more spectacular the views become. As we ran out of daylight, we found a perfect rocky bench, seemingly on top of the world at over 5700 ft elevation to make camp on. When we kicked he boulders off the surface, a nice bedding of sand was exposed, perfect for sleeping. I am quite certain had a plane flown by they would have considered us crazy camped along a cliff wall, tents staked into shale rocks and sand. The views were nothing short of spectacular. 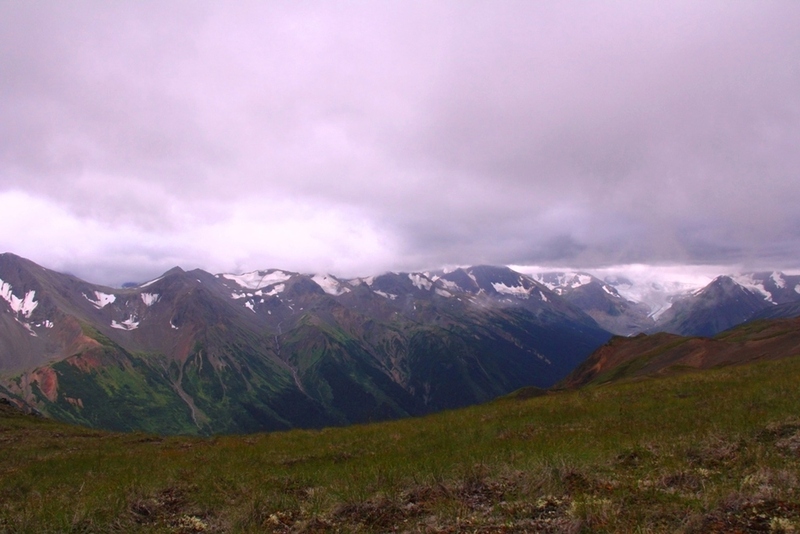 We were nearly on top of the mountain; the valley was stretched out far and wide below us. The countryside was larger and more expansive than anything I had ever encountered let alone attempt a spot and stalk hunt. 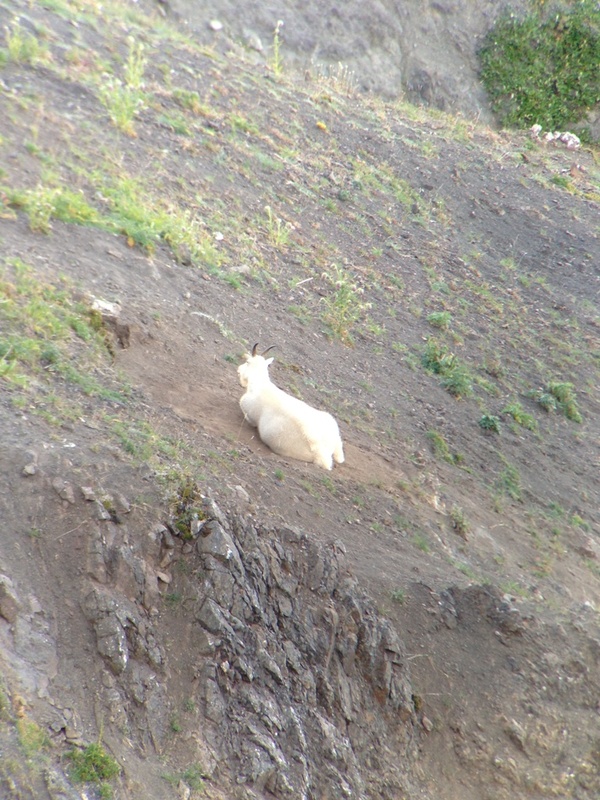 There was a nanny mountain goat with her kid that we spotted with my 85mm Swarovski spotting scope on the mountain across the valley floor. Even with my powerful scope they were so far away they were but tiny dots barely to be seen. Still no stone sheep rams were to be found. Two days hike....we were two days into our hike up the mountain to locate the rams and we had at least two more days until we would be in a position to spot where the rams were rumored to be. It was decided that the best way to potentially spot the rams would mean that we would have to lose all the elevation that we had spent two days gaining, cross the valley floor that lie in front of us and climb up the mountain opposite of where we assumed the rams may be on. This was our best chance at spotting the ghost rams and formulating a stalk if in fact they do exist. Surrounded by rock cliffs and impassable terrain, we were forced to climb to the peak of the mountain in order to safely navigate around the cliffs, gaining vertical feet that we knew we would turn around and lose. At the top, 6500 ft elevation, we found melting glaciers and our first tangible sign if wildlife, a shed antler from a Caribou. The shed was most likely a couple of years old. If it weren't so heavy I would have been tempted to pack the find off the mountain. Instead, it lays on the peak forever. Impassable I thought as I approached the edge, but leave it to Bryan as he somehow managed to find a goat trail that was navigable. This was the first point in our trek that Jeff got openly scared and rightfully so. Having grown up on the mountain and having done numerous similar trips, I felt comfortable making the decent but for a first timer, it was nearly too much. Bryan took the lead to show Jeff a clear path and I held up the rear to help coach him along. Learning to slide with the river of shale and sand all while balancing a heavy load is no easy feat, especially when a mistake will take you off a cliff into the abyss below. You are literally rock skiing down the mountain; an epic adrenaline rush to say the least. This was a dangerous but necessary path. Slowly we made it off the steps of shale and cliffs to the grassy flats below. Jeff's legs were spent, partially from the decent, partially from being rung out from a powerful cocktail of adrenaline and fear. It happens up here, your mind can wear out your body faster than the mountain. This was Jeff's biggest challenge so far. He owned the mountain, looked his fear in the eye and not only overcame it, but loved it. Once we reached the plateau below, we were once again forced to climb, this time to reach the top of the next bench, a seemingly short 500 vertical ft that would afford the vantage point that we needed to see the valley that swept out below us. Our hiking future lay before our eyes. The bush was thick and heavy, the decent to the river below was steep. It took us until dark to reach the river that winded through the bottom if the valley, our ending elevation was 2900 ft. Bryan and I had packed wading slippers and we each took turns crossing the deep, swift water in our best effort to keep our feet dry. Because there was no rainfall and without worry of flash floods, we were safely able to make camp along the river bottom. We were all pretty well exhausted from the days trek and all welcomed sleep. I awoke to the sound of the river flowing. My body was aching, face swollen from the physical demands that I had put upon myself over the previous few days. 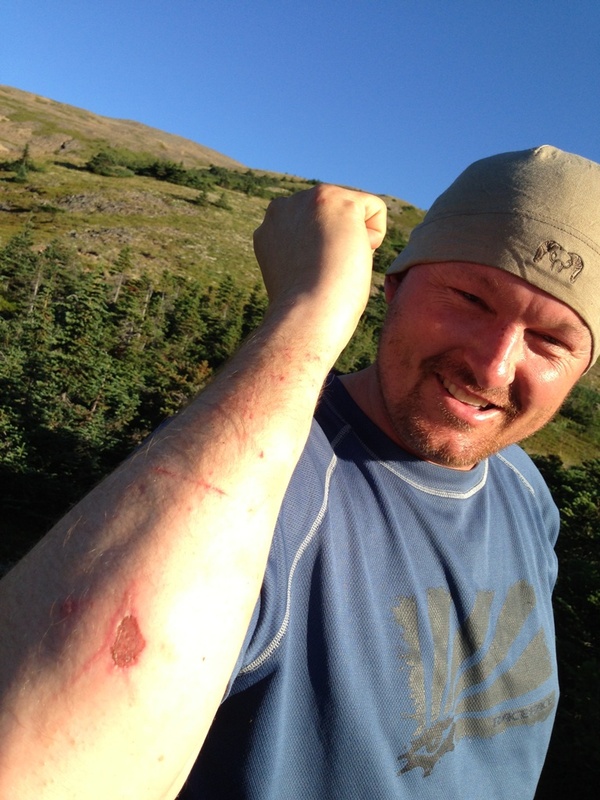 Today would be worse; bushwhacking up the mountain to re-gain the 3000 vertical ft we had lost the day before. We made our way up the mountain by way of a heavy flowing creek which can be very risky as mountain topography can become steep and cliffs on either side of the banks can trap you.Fortunately, we had been able to glass the creek the day before to determine that our route was safe. The creek was fast moving; the waters were murky brown. Zigzagging across the creek was made difficult with knee deep water. Our saving grace was the wading slippers as they allowed us dry passage across the creek. When we left the creek bottom to head cross country up the mountain I was worried about heavy bushwhacking, climbing a 35% grade with a heavy pack on your back and having the bush push you back while maneuvering over logs is a nightmare for my small frame. I fatigue physically in those conditions not to mention the mental frustration that comes with your struggle. I literally thanked God when our passage proved to be steep, yet by and large bush free. We were able to follow a dry creek bed straight to the alpine and out of the timber. It was the "yellow brick road" of the mountain layered with a soft covering if moss, no bush and no whacking. Excluding the first half mile of heavy bush, this was an easy day’s climb, well as easy as they get given the conditions. We were so high up on the mountain that we were literally looking down at two mountain goats below us, one was a bruit. 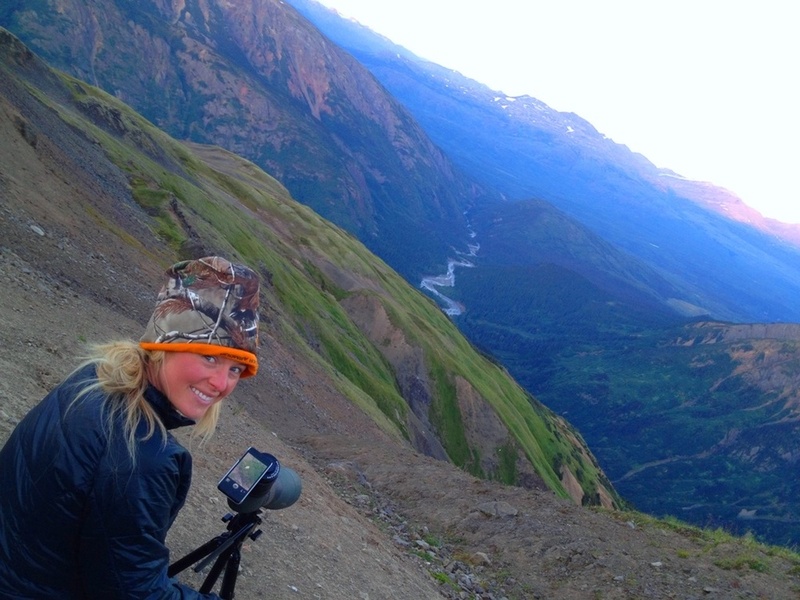 After we found our camping spot and dropped our packs, I grabbed my spotting scope and cameras and made my way back to the goats to get photos and video if them resting and grazing along the mountainside. After all that hard work, I was once again in my happy place. This is what I live for. There is nothing more awe inspiring than to be a part of an animal’s world, completely undetected. These goats literally had probably never before encountered a human. ; A place relatively untouched by modern man. After dark, I stared across the valley memorized by the sheer mass and beauty of the land before me. Permanent glaciers frosted the highest peaks, shining across the valley. The excitement from the day was out weighing the exhaustion that my body was feeling so I lay awake for hours pondering our journey, reliving the previous moments of triumph that had come so far, looking forward to those future moments that were yet to unfold. Sleep must have overcome me somewhere in my thoughts and I awoke to dark skies. We were going to get our first rain of the trip. Cloudy skies can provide the perfect lighting for glassing animals at distance, which is where I found Bryan. He was just over the edge from camp glassing relentlessly for signs of the ghost rams, making best use of the perfect lighting conditions. So far we had gained and lost 8000 vertical feet of elevation with over 35+ legitimate hiking hours with packs weighing in from 73-85 pounds. We had reached what we believed would be the Promised Land for huge rams when began the trip. After hours of glassing, there were no stone sheep to be found. Something was wrong. Sitting there on the side of the spectacular mountain ready and excited to find the ghost rams, yet physically exhausted and swollen from exertion I listened to Bryan speak, for the first time ever, to the man that had actually seen the rumored band of giant rams in real life all those years ago. Apparently, rumor still has it that the monster rams did exist all those years ago; but they were found on another mountain over 10 air miles away. Our hot tip that was 95% sure that we made our way to the correct mountain had been incorrect. All if the time effort that we had put in so far and we had climbed the wrong mountain. Mother Nature seemed to feel our pain, crying rain down on us for the rest of the day. The only thing left to do at that point was to scour the up the valley to be sure that a ram was not hidden in the fold of the mountain just out of site. We had came all that way and did not want to miss a thing. The glassing uncovered plenty of mountain goats, but no stone sheep. We all enjoyed taking the day to rest our bodies and legs while visually exploring the mountain. Jeff and I melted down a snow glacier into drinking water, sipped on hot tea and took much delight in filming and photographing the many mountain goats that were surrounding us. They made camp life a delight watching them feed and bed right before our eyes, we were literally living alongside the mountain goats less than three hundred yards from them. Jeff and Bryan seemed to have no trouble taking cat naps throughout the day, but I was still too excited to completely rest. I dream to be on mountains and I couldn’t hardly hold still let alone sleep. The next day, we packed up our camp, confident that we had not overlooked an inch of the draw, knowing that there were no stone sheep rams and began our trip back out. The first part of our hike was easy, alpine, downhill, my hiking love. This lasted for a short couple of hours. The next two days are some of the most formidable hiking days of my life. Granted our packs were significantly lighter having consumed most of our food by this point but the terrain on the way out was much more difficult than our arrival had been. We chose to try and follow the river bottom out, then head up the mountain we had originally climbed on day one and back to the boat. A seemingly simple plan. The Northern terrain and bush is very deceiving. Even when you know you are in for a hell of a hike, sometimes, you just can’t wrap your mind around how challenging and unforgiving the mountain can really be. Thankfully, we were blessed with warm dry weather as the bush would have been a slippery nightmare otherwise. Climbing back up the mountain, we were as steep as one could physically pass, clinging to bush, literally pulling ourselves up the mountain, clawing our way out. We finally reached the boat some three days later. As hunters, we kill to have experienced the thrill of the hunt, awe inspiring moments that are created in the field and to nourish our bodies. This trip was about three friends exploring the untouched, chasing a dream and possibly a long past ghost. It is only when you dare to venture where no man has gone before that you find that hidden jewel and if you are afraid to look, it will never be discovered. Trips like these create the concrete foundations of friendships and trust, forming bonds that last not only our lifetime, these experiences live as stories will be told for generations.